To be fair and balanced, Hollywood is as notorious for its deal makers advancing “the Art of Steal” as it is for casting couch hi-jinks for which Harvey Weinstein has been “reputation-ally cremated.” Just as Harvey is no lone wolf for gaslighting aspiring (and well-established) actresses and coercing them to observe (or enable) his sexual deviant behavior, Weinstein’s Glasser is not the only film finance aficionado who has played the deviant game of “hide the banana from investors.” The industry-common scheme is taking investors’ money, then later informing them the projects they backed either ‘died on the vine’ or courtesy of using two sets of accounting books, produced meager returns. One classic case study is the Academy Award winning film and box office blockbuster “Crash”, coincidentally produced by David Glasser and industry titan Bob Yari. This was a small budget project investors backed but “somehow” didn’t produce any profits for distribution to those investors. For the record, the film Crash, written and directed by Paul Haggis, was produced on a budget of $7.5mil and brought in $250mil in ticket sales. According to Glasser’s partner Yari, the film was not profitable. According to a civil court finding, it was, and the producers were ordered to disgorge millions. 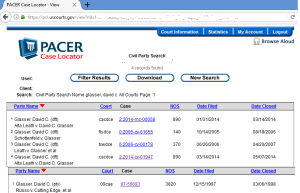 The connection between Glasser in that case, seems more than ‘tangential’, a phrase Glasser has invoked multiple times to investigators when being named a ‘person of interest’ in film funding schemes that have gone sideways under his watch. 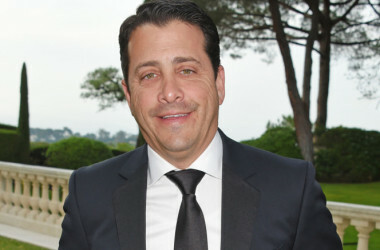 Glasser was also a target in a convoluted criminal investigation into the 2001 financing behind a remake of “Devil and Daniel Webster,” the first and last directorial debut for Hollywood bad boy Alec “Bloviator” Baldwin, who also starred in the film with among others, Sir Anthony Hopkins and Jennifer Hewitt. As reported at the time, before the film could be completed, Baldwin went over the limit on expenses, including renting a government venue for shooting certain scenes. When confronted with the bill, he claimed (to the FBI) that Glasser committed fraud. The reels were ultimately seized during post production editing by a bankruptcy court. In partnership with Bob Yari, Glasser then quietly acquired the rights from the bankruptcy court for pennies, the “new producers” then changed the title and sold the property to Starz. The story behind Glasser’s role in the financial shenanigans is the topic of a novel making its second way around book publishing circuits, but upon closer look, that case is part of a longer trail in which Glasser has found to have defrauded investors. 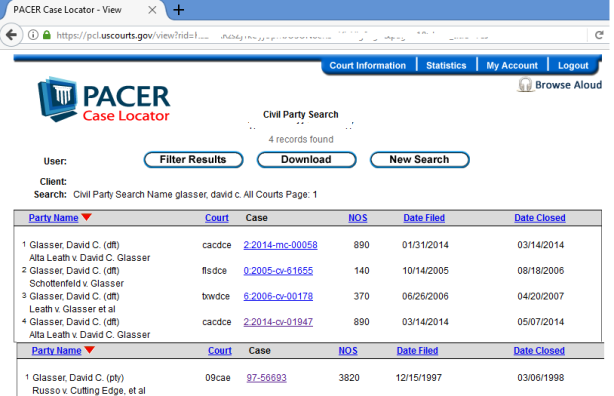 A quick trip to court record database www.pacer.gov provides more insight to cases back in ’05 ’06 and ’14 3 other cases prior to ’05 are not available in the pacer.gov dbase, but through a stealth investigations, those records are being held pending what could prove to be a blockbusting class action law suit against Glasser. Tagged broker-dealer Hanover Sterling, civil fraud, David Glasser, Harvey Weinstein, money laundering, pre-production film financing, weinstein, Weinstein & Co.